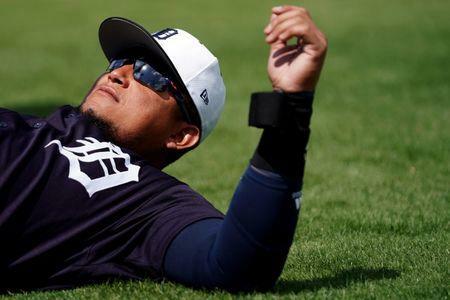 Miguel Cabrera continued his resurgent spring Sunday, hitting a two-run homer and two-run double as the Detroit Tigers walloped the Toronto Blue Jays 18-6 in Lakeland, Fla.
Cabrera, who turns 36 on April 18, is coming off an injury-shortened 2018 season in which he hit .299 with only three home runs and 22 RBIs in 38 games. He has only 19 home runs and 82 RBIs in the last two seasons. But Sunday's performance now gives the two-time American League MVP five home runs and 15 RBIs this spring, while sporting a .348 batting average and 1.165 OPS. Paul Goldschmidt homered in the first inning and Evan Mendoza hit a walk-off single as St. Louis edged Miami in Jupiter, Fla. Jack Flaherty pitched four scoreless innings for the Cardinals, giving up only one hit and striking out three. Third baseman Jeff McNeil drove in four runs and Juan Lagares homered as New York topped its divisional rival's split squad in Port St. Lucie, Fla. Matt Adams hit a three-run homer for Washington. After falling behind 3-0 in the second inning, Houston scored the game's final five runs to top Washington's split squad in West Palm Beach, Fla. Right-hander Gerrit Cole gave up three runs on five hits in 5 1/3 innings for the Astros. Clint Frazier's bases-clearing double capped a four-run sixth inning and propelled New York to a win over Minnesota at Fort Myers, Fla. Left-hander James Paxton gave up two runs in 5 2/3 innings to get the win for the Yankees. Philadelphia scored in each of the first seven innings, pounding out 18 hits to hammer a Baltimore split squad at Clearwater, Fla. Odubel Herrera and Aaron Altherr combined for six hits, six RBIs and five runs scored for the Phillies. Pittsburgh's Jung Ho Kang homered in the first, Baltimore's Zach Vincej hit a sacrifice fly in the eighth, and the Pirates and Orioles played to a tie in Sarasota, Fla. Chance Sisco, who scored on the sac fly, was 3 for 3 for Baltimore. Second baseman Bret Boswell had three hits and drove in the deciding run as Colorado edged Cincinnati at Goodyear, Ariz. Taylor Sparks hit a two-run homer as the Reds made a game of it, but Cincinnati stranded a runner at third to end it. Adam Engel homered and drove in two and 11 different Chicago batters got a hit in a win over Cleveland in Phoenix. The Indians received a scare when All-Star third baseman Jose Ramirez was carted off the field after fouling a pitch off his left knee, though the team labeled the injury a contusion. Designated hitter Phillip Evans led a Chicago hit parade with four hits (one a home run) and six RBIs as the Cubs blasted San Diego in Peoria, Ariz. David Bote added four hits and Cristhian Adames had three hits and five RBIs for the Cubs. Zack Godley pitched six strong innings but took the loss as Milwaukee topped Arizona in Maricopa County, Ariz. The Diamondbacks right-hander gave up two runs in six innings, giving up only three hits and striking out three with one walk. Ozzie Albies had two hits and an RBI, and scored on Brian McCann's two-run double as Atlanta doubled-up Tampa Bay in Kissimmee, Fla. Tampa Bay's Carl Chester was thrown out at home on an eighth-inning double by Kean Wong to kill a potential Rays rally. Stephen Piscotty, Jurickson Profar and Ramon Laureano each homered to propel Oakland to a win over Bay Area neighbor San Francisco at the Oakland Coliseum. Lefty Brett Anderson threw six scoreless innings for the win. Kort Peterson's solo home run in the top of the ninth off Jairo Beras allowed Kansas City to tie Texas' split squad, and that is how the game ended in Surprise, Ariz. Cam Gallagher also homered for the Royals; Tyreque Reed homered for the Rangers. Second baseman Chase d'Arnaud doubled and designated hitter Hunter Pence drove in a run as Texas' split squad fell to its Triple-A affiliate at First Tennessee Park, the Sounders' home field in Nashville.